I setup shop in Amanda's living room. My backdrop stands wore a white bed sheet for the first background, and I had a sheet of black velvet to drape over it for the second background. Velvet really eats light a lot better than the black bed sheet I used to use. I had just recently bought a pair of used Alien Bee B800 studio lights with matching 48" Fotodiox octaboxes. I setup one at 45 degrees to camera left and the other 90 degrees to camera right, both at head level. Both were set to about 1/2 to 1/4 power. When the white background was used, I also had a Canon 430EX speedlite on a short stand behind my subjects to light the backdrop. This was the first time I'd gotten to use the B800's on a production shoot, and they worked wonderfully. The fast recycle time even at relatively high power, combined with the large, soft area of the octas was wonderful to have. I used my Sigma 17-70mm lens for all of the portrait shots, and my Canon 10-22mm for the BTS shots. I often wished I could go longer than 70mm for closer shots without getting right on top of the small birds, but none of my AF lenses span the 70mm line, and I didn't want to constantly swap lenses or lose my wider angle ability. This was the first time that I've ever wished I owned a 28-135mm lens. To keep a decent depth of field at such close range, I shot at f/11 to f/16 most of the time. Next time I shoot a subject that size, I'll stay at f/16 (or smaller) all day due to the short working distance. I never would have been able to shoot f/16 at ISO 100 with a 2-second recycle time without the B800's. Did I mention that I loved them? 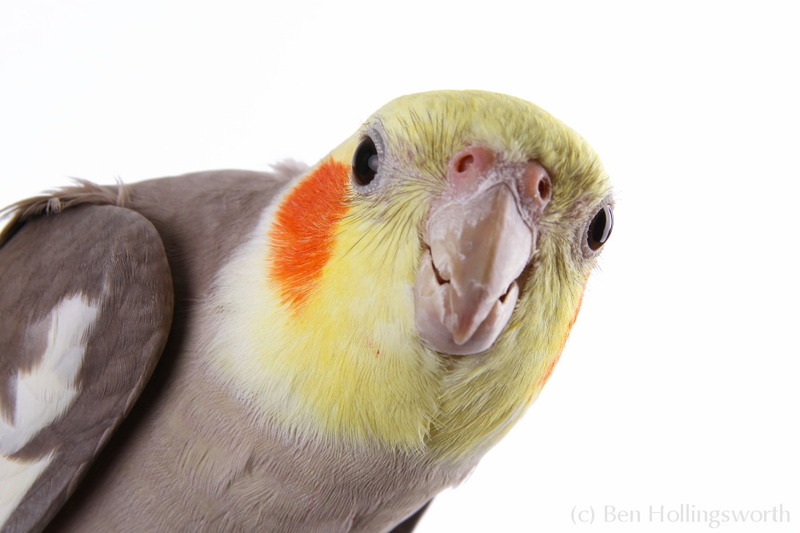 Since this was my first time shooting animal portraits and I needed to experiment, I shot for almost an hour. We started with the white background and later switched to black. In retrospect, I wish I'd started with black, because I like the look of those shots better, but the birds had gotten bored & sleepy (or blinded) by that time, so their expressions weren't nearly as good. 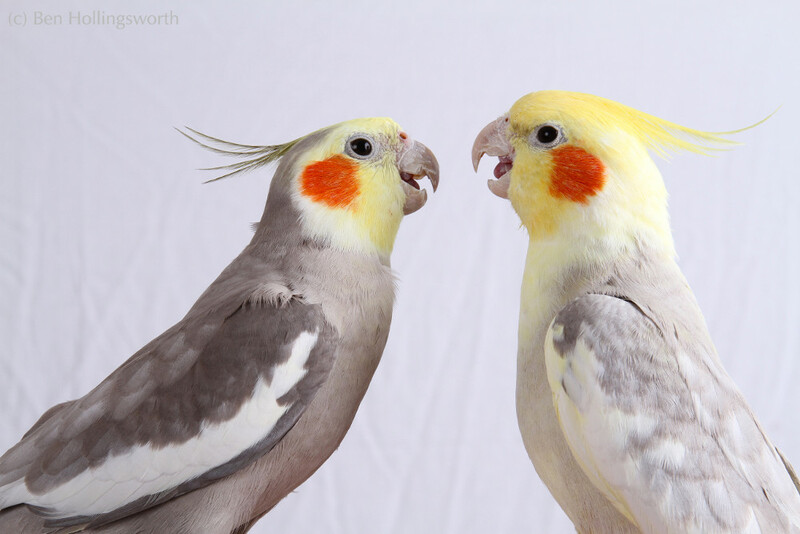 The rescue organization wanted to show how friendly the birds were in order to promote adoption, so we got a few shots of Choco and Goldie interacting with their owners, too. The shots of them on Amanda's shoulder turned out well. The shots of them with her preschool daughter... not so much. 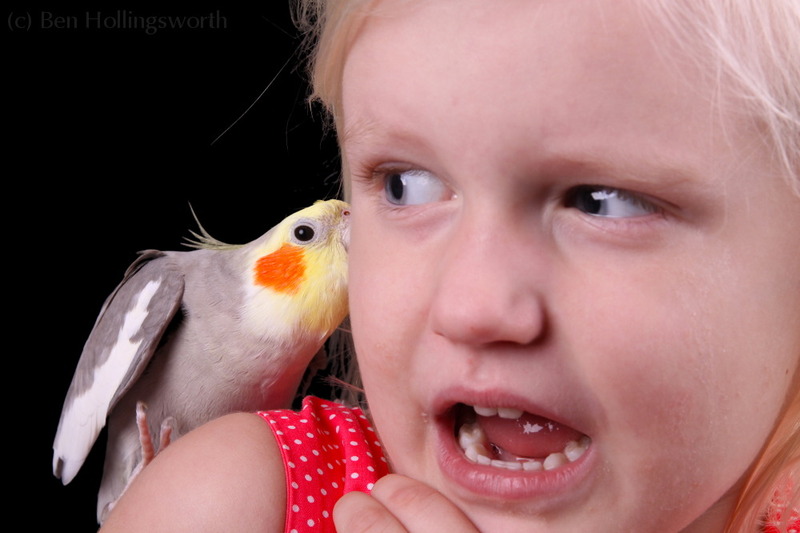 Choco tried to remove the poor girl's earring, with predictable results. After that, the whole human interaction idea went down the tubes, so we resumed shooting just the cockatiels. One thing I'll do differently next time is to bring my own photo-friendly perch for the birds. We used the birds' own perch this time, which was quite sturdy and comfortable. It was made from a small tree, so it had lots of vertical branches with only a single horizontal branch on which the birds would sit. Framing a shot without any of the vertical branches was difficult, and I eventually just gave up and spent a whole lot of time in post cloning them out. 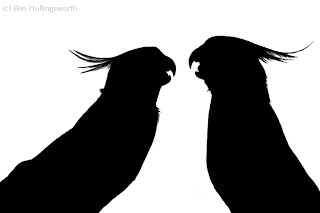 If I'd had a perch with a longer horizontal limb and no intervening verticals, my life would have been easier. Another thing I'll do differently is to make sure that the white background is lit well enough that it's completely blown out. I didn't give it nearly enough light this time, and once again spent lots of time in post rotoscoping the birds and pushing the background to pure white. Even the black background had this problem, but in the opposite direction and to a lesser extent. I should have pulled the birds up farther away from the background so that the light didn't hit the velvet quite so hard. Black velvet eats light pretty well, but it's not perfect. Flagging both lights from hitting the background might even be worth while. Another 5 minutes of thoughtful setup time could save hours in post. To perform all of this postprocessing, I used The GIMP on my Linux workstation. This sort of editing is outside the scope of AfterShot Pro. You can read about the various software I use in a previous post. Let's walk through a particularly bad example in which I had to remove branches and lighten parts of the background. You need to start by doing any of your cloning before you worry about bleaching the background. For this, I use GIMP's clone tool with a hard-edged, circular brush at 100% opacity. Click on a nearby area of the proper color to use as your source, and then paint over the offending branches or other unwanted features. Do the same, but with a smaller, soft-edged brush, to get rid of stray feathers, if you're going that far. Don't worry too much about smoothly merging the newly-painted area with the old background, since you'll soon be throwing the entire area to pure black or white. If there are people in the shot, now is the time to use your healing tool to soften wrinkles and remove any zits or other unwanted features. Use a soft-edged brush and keep your opacity below 30%. You can build up your edit with many passes if needed, but you want to start subtly. 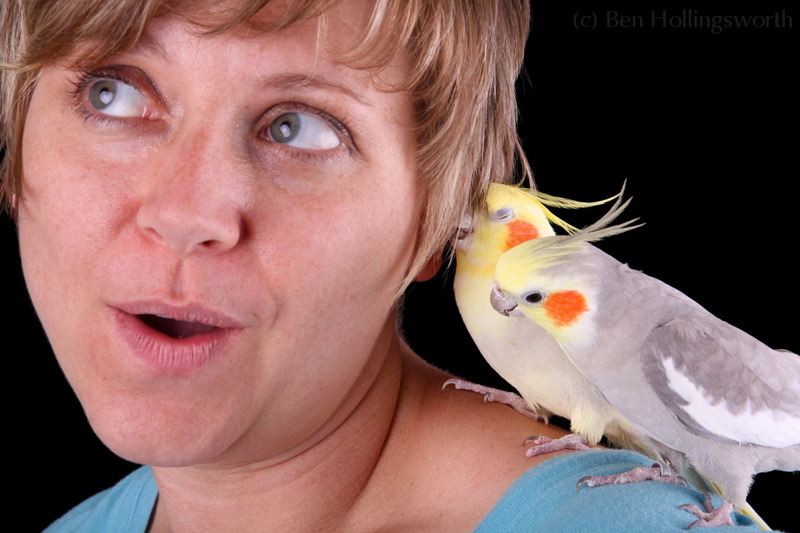 Editing people is more detail oriented than editing birds, of course. You can read about my human portrait processing techniques in an earlier post. With the unwanted features painted out, you can now turn your attention to the background as a whole. First, create a new layer by duplicating the current, edited image. Next, use the "Select by Color Tool" to select as much of the background as possible. Click on an area that's about in the middle of your background's color spread. If not enough of your background was selected, or if too much of your subject was selected, adjust the threshold window. I set mine at 15. Be sure click the "feather edges" option to avoid hard edges, otherwise the transition will be glaringly obvious when you're done. Once you've got a decent (but not perfect) background selection, right click on the new layer in the Layers window and create a layer mask. Use the current selection to populate the mask, with white as the background and black as your subjects. If your subjects are nearly the same color as your original background (as was the case with my light grey birds), you'll probably have to edit the layer mask manually to paint in some of the areas that weren't properly selected by the Select by Color Tool. You'll want to maintain a narrow, fuzzy edge between white & dark, so blurring any manually-edited edges may be in order. Once the mask covers your subjects in pure black and your background in pure white, it's time to perform your color adjustments on the background. I simply used the Curves Tool to over- or under-expose the entire background. Of course, you could change color or even drop in a new background image if you wanted to. The key is to get the layer mask set properly. That's about it. Any time I do significant work in GIMP, I always save a copy as an XCF (GIMP's native file format, like PhotoShop's PSD) so that it retains the layers & masks that I spent so much time creating. The final JPEG gets created by merging the layers & saving the result. In the end, the rescue organization shelved the project for reasons unrelated to my photos, so these images never made it past my own web site. However, I did gain some valuable knowledge about photographing animal portraits, and some of it can surely be applied to shooting humans, too. The flaky equipment that I mentioned was my Canon 7D body, which was beginning to succumb to the "Error 30" problem that I described in an earlier post. Fortunately, I had a backup 50D body, so it didn't significantly affect the session. What's your favorite animal to photograph, and why? Let us know in the comments below. 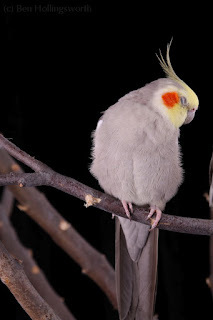 I just wanted to say I saw your post on G+ and I'm so happy you featured cockatiels! 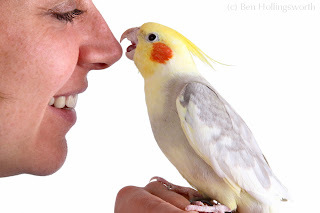 We are my cockatiel's third home - they are indeed friendly, but not for everyone. These are some great portraits and candids. Thanks for the compliment, Christine. They were certainly fun birds to work with and showed plenty of personality before they grew bored with me. 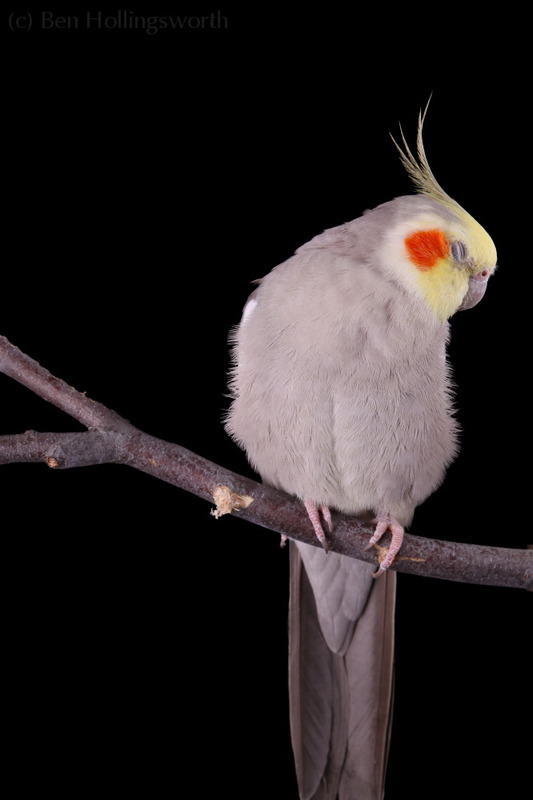 I look forward to working with more birds like this in the future. 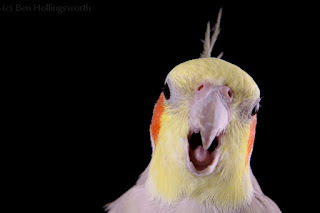 Hi Ben Hollingsworth, Iam structuring a website and interested to know if i can use your cockatiel pic in my website. I am from India., I will mention your name on credits. Hey Vijay. Thanks for asking first! I'd be happy to license that photo to you for an appropriate fee. Please email me at Ben@PrairieRimImages.com to discuss your intended usage and my fee.